With a false look and strong design, this vanity will help any bathroom look nicer. Add a classic feel to your bathroom with this simple vanity set from GLACIER BAY. The Ashburn 36 inch bathroom vanity paired with the 37 inch Lily White engineered stone top offers a design that is both decorative and fully functional to complement your decor. This upscale vanity combo boasts an understated grey finish and a clean, sleek profile for a modern look. Two cabinet doors with soft-stop bumpers and three left-side drawers offer a bevy of storage options for linens and bath essentials, setting the tone for a tidy powder room. The sturdiness and craftsmanship of this vanity cabinet offers a custom look, while small details like leg levelers instill confidence for perfectly stable setups. Pair this vanity cabinet with other items from the Foremost Ashburn collection for a complete bathroom makeover. Add the warmth and elegance of natural wood to your bathroom, with the Naples 36 inch Vanity and 37 inch Lily White engineered stone vanity top with pre-attached rectangular under-mount vitreous china bowl. Treated with an Antique Walnut finish, this furniture-style vanity cabinet features 2 doors and 3 drawers that offer ample storage space. The cabinet's full-extension drawer glides provide smooth opening and closing and its maple interior is coated with PVC for easy cleaning. The cabinet features black birdcage-style door handles for a decorative touch. Classic and clean, the Rocara Collection vanity is sure to become the focal point of any bathroom. With the ability to enhance any bathroom, this vanity offers style and functionality with two fully extendable drawers, a convenient interior adjustable shelves and ample cabinet space behind a sophisticated shaker style door. The graceful styling combined with the added elegance of a white vitreous china vanity top with an integrated rectangular sink makes this bath furniture collection a perfect choice. Finished in antique grey with a recessed kick plate and brushed nickel hardware, this Rocara Collection vanity blends modern elements with traditional influences to perfectly complement any bathroom. Classic and clean, the Rocara Collection vanity is sure to become the focal point of any bathroom. With the ability to enhance any bathroom, this vanity offers style and functionality with two fully extendable drawers, two convenient interior adjustable shelves and ample cabinet space behind sophisticated shaker style doors. The graceful styling combined with the added elegance of a white engineered stone vanity top with a rectangular undermount sink makes this bath furniture collection a perfect choice. Finished in antique grey with a recessed kick plate and brushed nickel hardware, this Rocara Collection vanity blends modern elements with traditional influences to perfectly complement any bathroom. Millstream 37-inch W Vanity in Grey With a false look and strong design, this vanity will help any bathroom look nicer. Add a classic feel to your bathroom with this simple vanity set from GLACIER BAY. 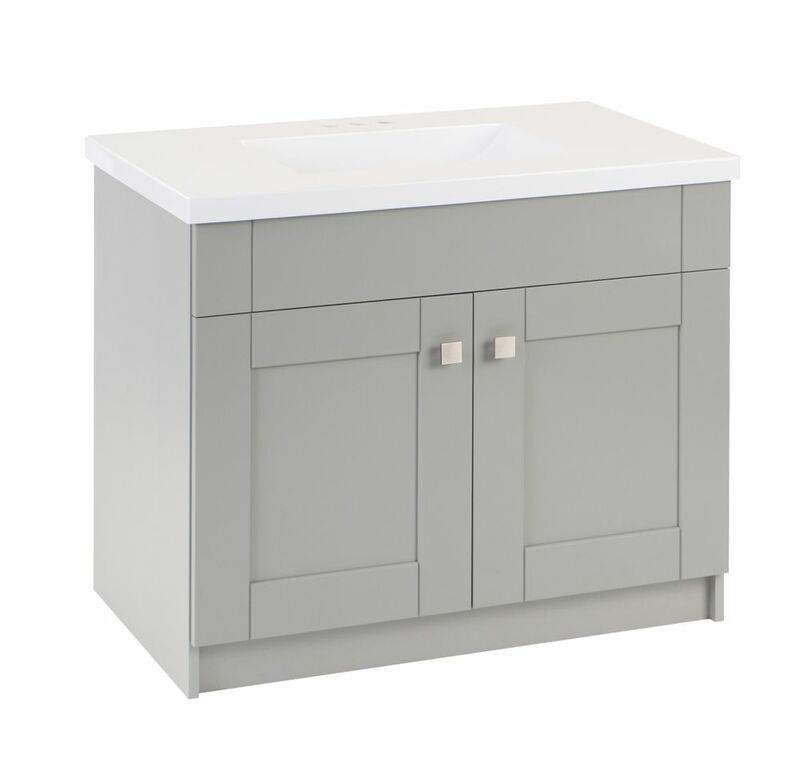 Millstream 37-inch W Vanity in Grey is rated 3.3 out of 5 by 3. Rated 4 out of 5 by Kurt from As advertised The vanity is as advertised, well packaged, no scratches. -1 star because the doors needed a slight adjustment (not a big deal) and there is not back to the box. That makes installation easier but doesn't hide any sins on the back wall. Rated 5 out of 5 by kpuck from sleek, sturdy vanity My husband and I purchased this vanity for our new bathroom we're installing in the basement. It's got a great sleek, modern appearance and the colour is neutral without being boring. It's a very sturdy unit. The sink has nice, modern, clean lines. I particularly like that the doors are adjustable, so that you can narrow the gap between them, move them left & right (slightly) or up and down, as needed to ensure they look level and even. We're really happy with the quality of this vanity. It is a great value. We were a bit anxious to open it based on the other review that mentioned scratches on several of the same vanity, but we have zero issues with ours. We're quite happy with it. Rated 1 out of 5 by marymoon from Disappointed I bought it last week. When the contractor was ready to install the top. He noticed many scratches. I went to the store to do an exchange, they had only one and with the same problem, scratches. We went to another stored and there were 2 in stock but with the same problem, scratches. The associated were very helpful trying to find a good top for me but without any luck. I did some research about the cultured marble and I bought it because they said low maintenance , resistance to stain, mildew and chips. But now, I'm very disappointed with the product. Unfortunately I couldn't return because the contractor made a hole to the vanity to install it. If you want to buy it, check the top.